Our Gospel message comes to us today from Luke the 15th chapter, beginning at the 1st verse. What is the “job” of the Christian? Is it to serve on boards of the church? Is it to regularly attend the worship service? Is it to tithe and support the local church financially? Is it to read the Bible and pray? To all of these: YES! All of these are true. But, they are the outgrowth of the central and core principal of the Christian life. Our job is to love people we don’t have to love. We don’t have to love one another! Many people live in isolation; not loving other people. Many people live in seclusion; not knowing how or who to love. Others live so completely unto self that the only love they have is the love of self, the love of pleasure, the love of money, or some other idolatry. We were made to love. It is central to our created humanity. We were made to live in connection: in covenant with God and one another! A true Christian is a sign of contradiction—a living symbol of the Cross. He or she is a person who believes the unbelievable, bears the unbearable, forgives the unforgivable, loves the unlovable, is perfectly happy not to be perfect, is willing to give up his or her will, becomes weak to be strong... and finds love be giving it away. In Luke chapter 15 there are 3 parables strung tightly together; the parables of the lost sheep, the lost coin, and of the prodigal son. This chapter has one constant theme that Jesus is driving home to his audience, to us; God’s love for outcasts and sinners. God’s love is not contingent upon our goodness. If anything, the New Testament presents Jesus loving the unlovely and rejecting the pious, the self-righteous, the upright; because of their pride and conceit. The central thesis: God loves outcasts and sinners. So should we! Upon examining this passage of Scripture, some key principals about the love of God jump off of the pages of the Bible. The story of the prodigal son is one which is familiar, even to non-Christians. It is interesting that many of the major biblical themes are commonplace in American society. The Church has had such a wide and far reaching influence on this society since its inception that many biblical stories are a part of the fabric of mainstream idiom, literature, and thought. Stories like the prodigal son, Noah’s Ark, Adam & Eve, the betrayal of Judas, and a host of other biblical accounts are at least familiar, even if many don’t know fully of their origins, to most people. It is for this very reason that great care must be given to the consideration of any such passage. Our familiarity may, and often does I would suggest, leave us wanting for application and genuine meaning. Familiarity, in this case, fails to cause great understanding; it easily leads to blind obscurity. Learn to see this parable differently. In our constant focus on self, we usually consider only the prodigal son. This passage is most often taught as the premier text which tells sinners that it is never too late to repent; never too late to return to God, our Heavenly Father, who waits longingly to forgive. This aspect is completely accurate, but it is not the whole story. God’s primary concern in the universe is not our temporal or earthly comfort. His primary concerns are not the myriad of things with which we distract ourselves in this material, physical, life. God’s primary concern in this world is not even the salvation of sinners. Jesus did not die on the cross solely or even ultimately so that you and I could be forgiven of sins or that we could spend eternity in Heaven with Him. All of these aspects of the Christian message are true! There is more to the story! The Gospel secures our happiness and peace but that is not its ultimate aim. Through faith in Jesus Christ, according to the Grace of the Father, by the work of the Holy Spirit regenerating our souls, we do find forgiveness of sin and life eternal. This is true but it is not the end, nor the foundation of the Gospel. This may sound strange to you. If it does it is because in the modern era preaching has become far too saturated with notions of human happiness to the exclusion of God’s holiness. Modern pulpits are filled with the power of positive thinking to the exclusion of the glory of God! We have traded the glory of God for the goodness of my emotional status. The parable of the prodigal son is about the son, yes, but not primarily. What of the other brother, the one who stayed? Why do we so seldom consider this man? Why do we so often portray him as evil? If we are honest, we have to admit that there is a little bit of the other brother in all of us who are religious. The other brother in the parable represents the Pharisees of Jesus day. Earlier in the passage the Pharisees are gossiping and accusing Jesus of wrong doing because He “eats with sinners and tax collectors.” In effect, they were saying that He is not trustworthy because rather than being religiously pious and judgmental, like them, He took the substance of His relationship with God to mean that He ought to love radically. In eating with sinners, the unchurched, the idolatrous, the traitor co-conspirators with the Romans who were the tax collectors, Jesus got His “hands dirty.” Upon seeing the return of his brother, the prodigal, the son who stayed was outraged! His anger was in some ways justified, wasn’t it? Why do you lavish him with gifts and have a banquet in his honor? What about me? I have been faithful? When did you ever get so excited about my never having left? The Church is sometimes rather Pharisaic as well, isn’t it? When I lived in Hawaii, there were a group of street preachers of a particular local ultra fundamentalist church. Routinely they would rail away at passersby; accusing them of being sinners in need of repentance, on their way to hell. They were somewhat of a local regularity and most people knew of their antics. I recall a local minster in town telling the story of how he once asked one of them what they would say to a prostitute. The reply from the street preacher was that if she did not repent she would be cast into hell. His reply to her was that if Jesus, the master were here, He would more likely take her into a restaurant, eat with the sinner, and offer to her a better way; the way of repentance, eternal life, hope, love, and healing from the brokenness of her life. While it is easy for us to point fingers at such misguided, condemnatory, judgmental, and ineffective methods of evangelism, what about us? It’s easy to point the finger at the other brother, at the Pharisee, who rather than rejoicing in the repentance of a lost sinner and at the love of the Father who facilitated the restoration of the son, cast judgment. What about us? How do we respond in similar situations? When we see someone at church who has not been in a long time, do we rejoice at their presence? When we hear of someone turning their life over to Christ, do we celebrate with the Angels in Heaven at the wonder of their salvation? Or, do we take pleasure out of saying, “it’s about time they got their life together... like me.” At the end of the day, though, the parable of the prodigal son is not ultimately about the prodigal son or the other brother. It is not ultimately about the sinner who was lost or the Pharisee who judged. It is chiefly about the father who dared to love radically! It is about the father who abandoned pride, the hurt of his son’s disobedience and lack of appreciation, and ran to meet his son, to welcome him home, to shower him with love and grace! Repentance is not the primary theme of the Gospel. God’s grace is primary. Our happiness is not central in the universe; the Glory of God; His love is central. The story of the prodigal son is primarily about Father! It is He who has ran to meet us! It is He who has showered us with grace and mercy; ran to meet us; forgiven us; prepared a feast for us. Why? Because the primary aim of God is to glorify Him and He is most glorified in us when we are most satisfied in Him. God has set His affection upon us and loved us unconditionally, according to His sovereign will and sovereign purposes! It is not we, who by our coming, secure forgiveness. It is He, by His grace, which covers us, adopts us, loves us; showers us with mercy! There is a kind of crystal called Labrador Spar. At first sight, it is dull and without luster; but if it is turned round and round, it will suddenly come into a position where the light strikes it in a certain way, and it will sparkle with flashing beauty. People are like that. They may seem to be unlovely, but that is because we do not know the whole person. Everyone has something good in him or her. We don’t get to choose who comes into our church doors. We open our hearts to Christ and His plans for us. We open our church doors to the masses and pray that God will draw in who He desires, according to His purpose for us. He sends whom He will send because it is He who draws them, as He has drawn us, by His prevenient love. Then we, like Christ, can be accused by the Pharisee, of dining with sinners; fellow sinners, likewise in need of grace; mercy; love. The greatest way to experience the love of God is to become a conduit of it. What is the job of the Christian? It is supremely to look like Christ. Let us continue to be a people who welcome fellow sinners to the table of grace; to the glory of God! Let us pray: Father, your love for us surpasses all our hopes and desires. Forgive our failings, keep us in your peace and lead us in the way of salvation. We ask this through our Lord Jesus Christ, your Son, who lives and reigns with you and the Holy Spirit, one God, for ever and ever. Amen. The Bible texts of the Old Testament, Epistle and Gospel lessons are from the New Revised Standard Version Bible, copyright 1989 by the Division of Christian Education of the National Council of the Church of Christ in the USA, and used by permission. Sermon contributed by Rev. Chris Surber. Jesus ate with sinners. 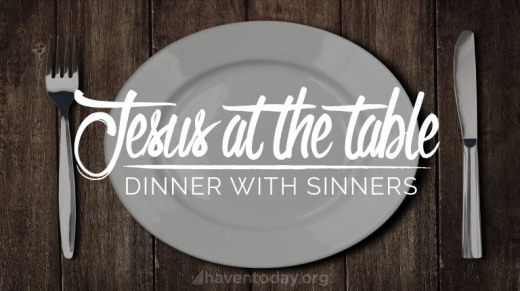 We have likewise been called to dine with sinners!